(CNN) Semantic satiation is the phenomenon in which a word or phrase is repeated so often it loses its meaning. But it also becomes something ridiculous, a jumble of letters that feels alien on the tongue and reads like gibberish on paper. For the last few years, after every mass shooting, the term immediately trends on social platforms. It’s not a good kind of trending: Among the earnest pleas for social and legislative action, the aftermath of each successive shooting inspires more and more memes and cynical jokes. Jokes, mere hours after a deadly shooting? To the voices behind the dark humor, the persistence of “thoughts and prayers” is the real joke. The repetition of “thoughts and prayers” is a product of the repetition of mass shootings. And to #ThoughtsAndPrayers critics, the repetition of mass shootings exists because no one is doing much else besides offering thoughts and prayers. There has been no major gun-control legislation in the nearly six years since Sandy Hook, the tragedy that was supposed to change everything. In fact, in the years following Sandy Hook, more states loosened gun buying restrictions than tightened them. 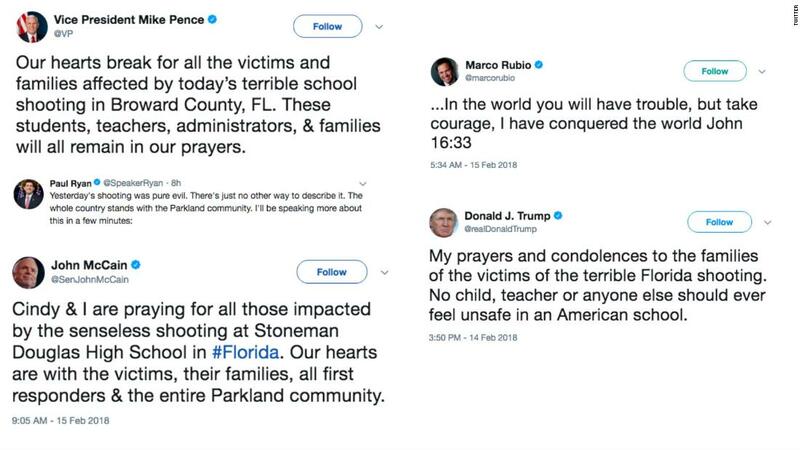 Politicians like Paul Ryan, Marco Rubio and even President Donald Trump were taken to task for their “thoughts and prayers” messages after the Parkland shooting. All have staunch pro-gun stances and financial ties to the NRA. In May, a teenager shot and killed 10 people at Santa Fe High School near Houston, Texas. Just days after the tragedy, Houston Police Chief Art Acevedo had desperate words for people who were content to remain inactive on gun control reform. After the Las Vegas shooting last October, Connecticut Senator Chris Murphy called out the phrase’s odd and complicated role in the cycle of mass shootings, grief and inaction. 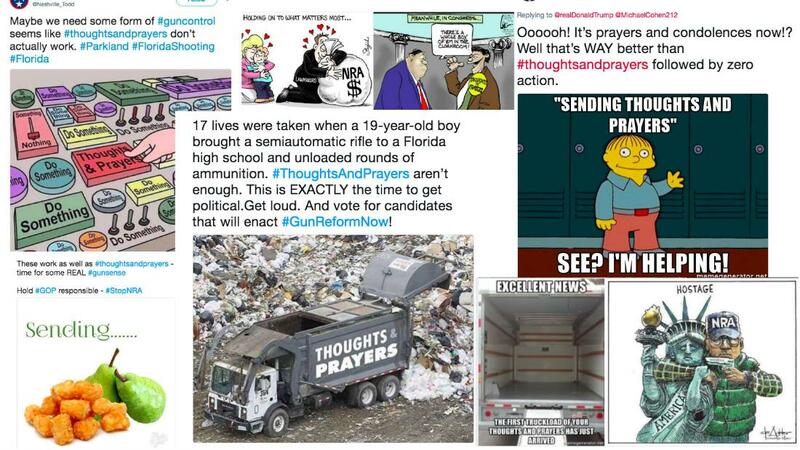 The devolution of “thoughts and prayers”-like sentiment has been years in the making. The further it’s embedded in our post-tragedy lexicon, the more it’s mocked as a form of civilian slacktivism, and more recently as a form of political obfuscation. A chart of Google queries shows that the phrase spikes during natural disasters and mass shootings. Between those incidents, the interest in, and familiarity with, “thoughts and prayers” has risen steadily over time. Comedian Anthony Jeselnik was one of the first to publicly make fun of the phrase. In his 2015 “Thoughts and Prayers” routine, he references the 2012 Aurora, Colorado, movie-theater shooting and the 2013 Boston Marathon bombing as occasions for faux concern. The audience roars and claps. 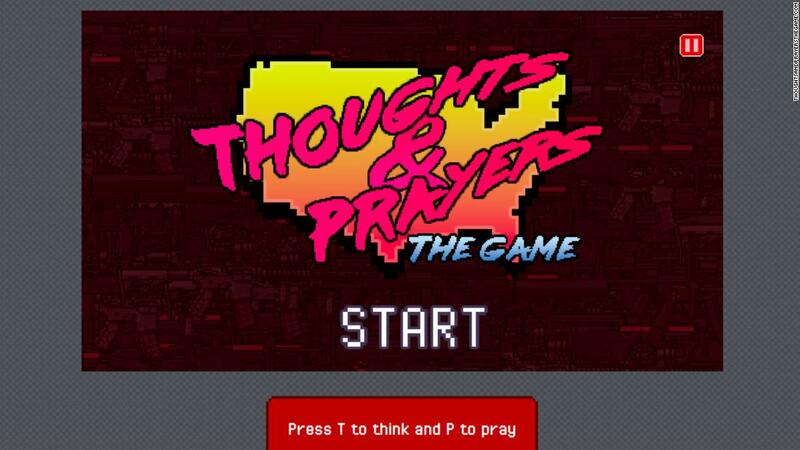 After the Orlando nightclub shooting in June 2016, video game developer Mike Lacher made a “Thoughts and Prayers” 8-bit video game. In it, you try to prevent mass shootings by pressing buttons that say “think” and “pray.” If you press a button that says “ban assault weapon sales,” you’re rejected. A 2017 episode of “BoJack Horseman,” an animated Netflix comedy about an anthropomorphic horse, is titled “Thoughts and Prayers.” In the episode some characters scramble to respond appropriately to a mass shooting while continuing to market a movie glorifying gun violence.As more mass shootings occur, the hypocrisy of acknowledging reality with “thoughts and prayers” while trying to sell a gun-flavored fantasy becomes more and more pronounced. The phrase has gone from sincere to funny, but not in a ha-ha way. It is political commentary. In the hours and days after a shooting, it can be undistilled frustration and grief coming out sideways, sometimes as a bitter chuckle and other times as a desperate shout. After 14 civil servants were killed in a December 2015 shooting in the San Bernardino, the New York Daily News, known for its bold, attention-grabbing headlines, ditched the wordplay. 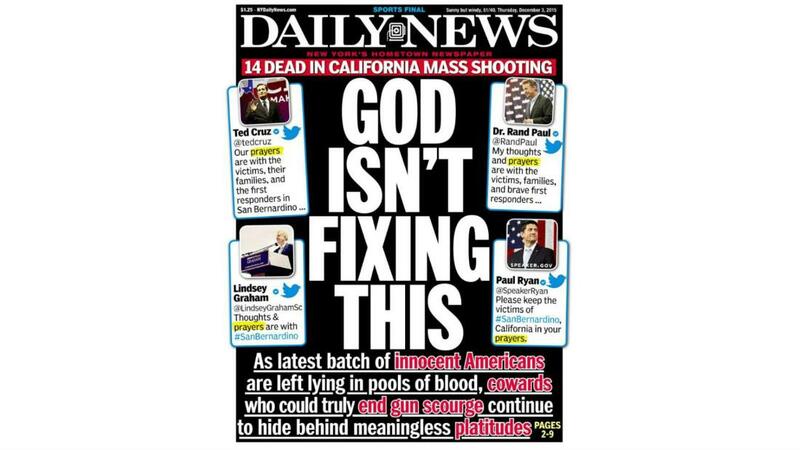 “GOD ISN’T FIXING THIS,” the headline screamed, along with the #ThoughtsAndPrayers tweets of Republican leaders Ted Cruz, Lindsey Graham, Rand Paul and Paul Ryan. Yes, even stylizing #ThoughtsAndPrayers as a hashtag has become a parody of the phrase’s mechanical deployment. Rarely on social media will you see the tag #ThoughtsAndPrayers used outside of a critical context. So when should #ThoughtsAndPrayers be taken seriously? Religious thinkers and leaders have sought to reclaim the phrase, seeing how rapidly its meaning devolves every time it is trotted out — and subsequently ridiculed — during every tragedy of gun violence. And Pope Francis has regularly called his followers to intertwine their prayer and works. When even religious leaders appear to be questioning the real value of #ThoughtsAndPrayers,it can be hard to place your faith in it. It begins to feel empty. It begins to feel reflexive, dismissive. And maybe even funny. Just not in a ha-ha way.